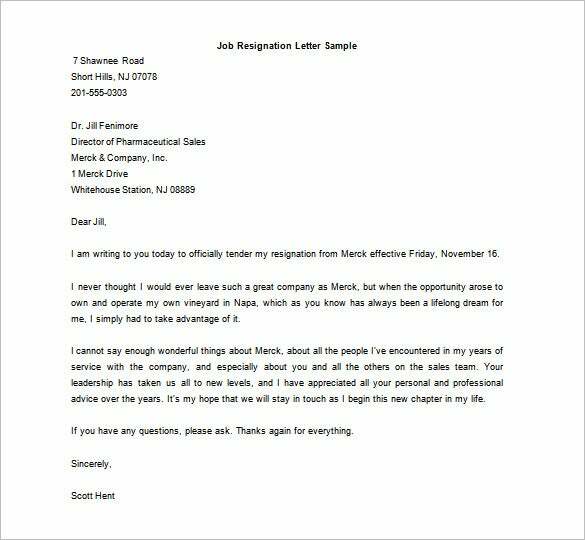 Your resignation letter is the last impression that you leave with your existing company and it should be as good as the new one. A poor resignation letter might cause issues while earning good recommendations from your old boss for your new office. 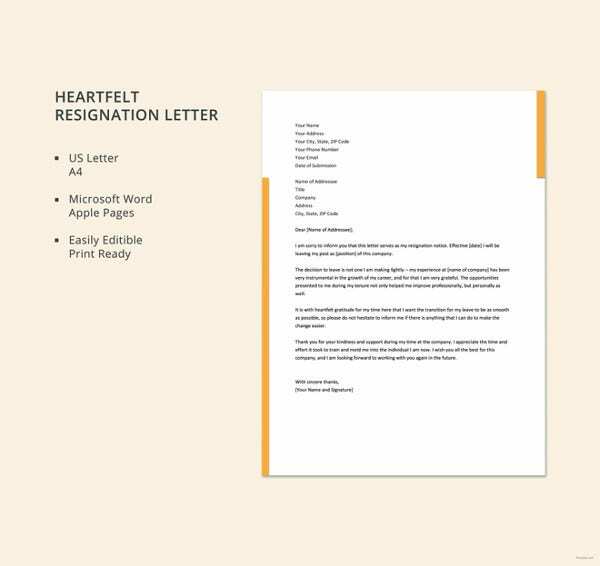 Thus, you better follow a formal letter of resignation template sample here. 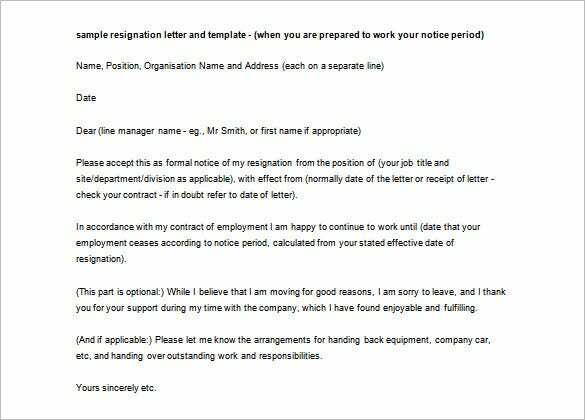 This is another resignation template example which you could use in case you’re announcing your resignation plans to boss in advance. The format of the latter is quite standard. The tone used is courteous from start to end. At the start you write about your decision to quit, followed by giving details about your new employment – this is optional – and lastly ending it with nice words about your current company and colleagues. 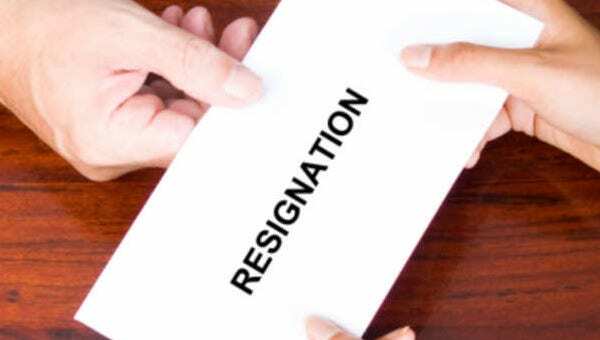 You must be extremely cautious when writing your resignation letter. 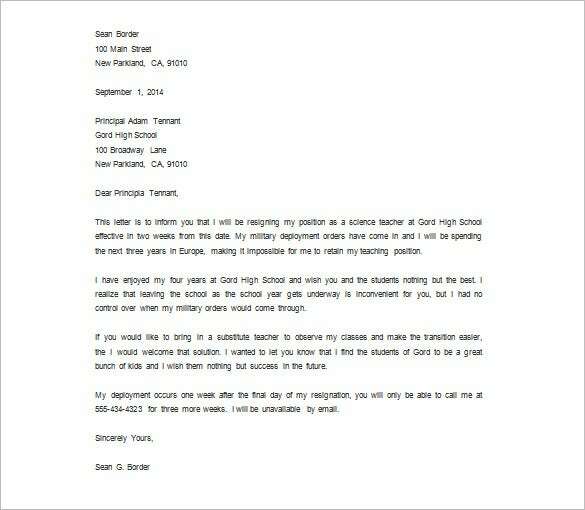 A well-worded resignation is well-remembered and your tenure as an employee is ranked as memorable. Also a well-written letter may help you win recommendations from your boss. 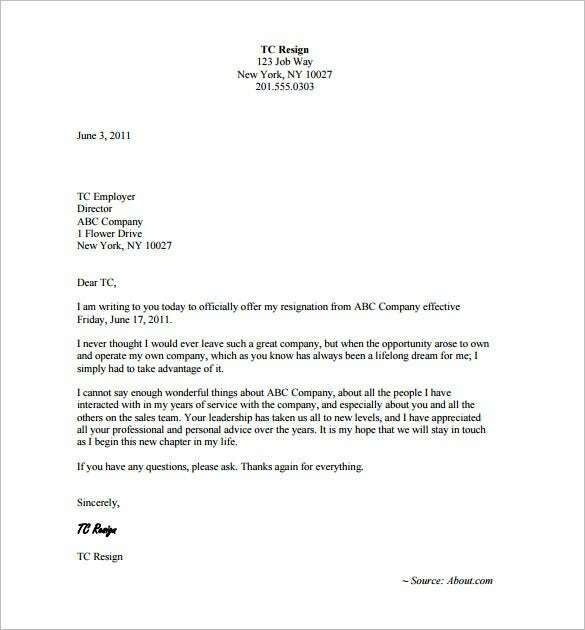 The tone of the letter should be polite and professional throughout. 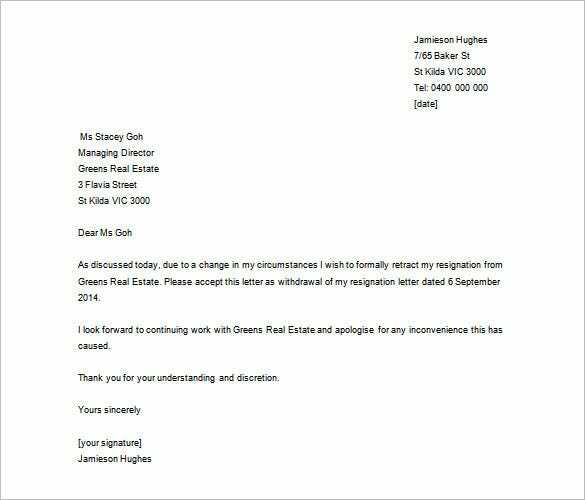 Make sure that you land your resignation letter in advance so that the replacement process takes place in time. 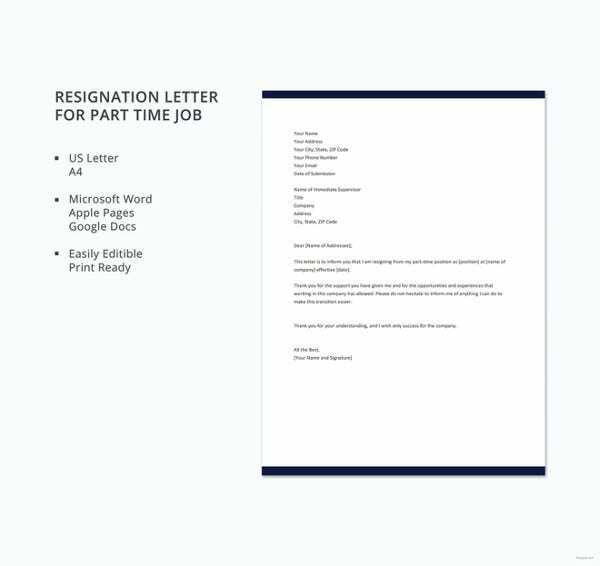 A letter of resignation template 2 weeks notice example will start with the basic information of your resignation and the last date of your job at the office. Follow it up with how much you enjoyed working in this company with your colleagues and the boss and the fact that you would be missing them. Are you teacher planning to resign soon? Well, then, you must submit your resignation letter minimum one month ahead of your last date at the school. 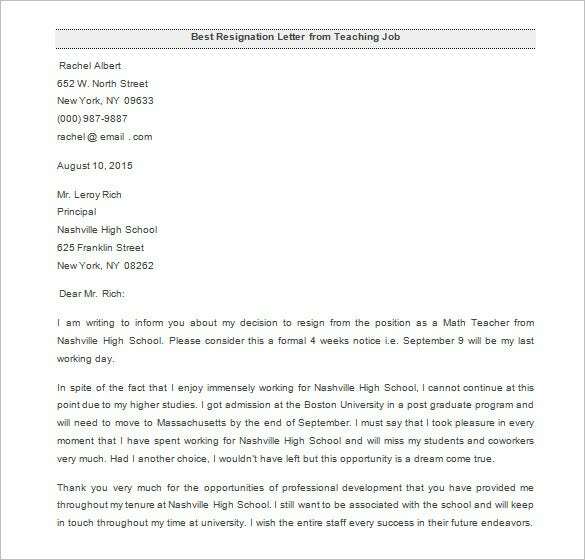 You might mention the reason for your resignation in the Teacher resignation letter template example and if possible, assure the school that you would help with an able replacement. 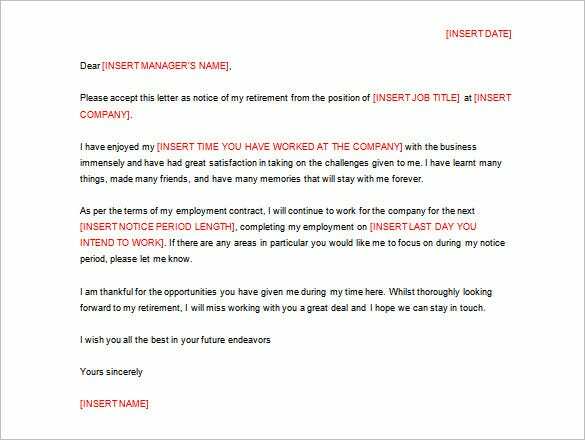 Are you planning to retire from your present company and looking for ideas on the retirement resignation letter? 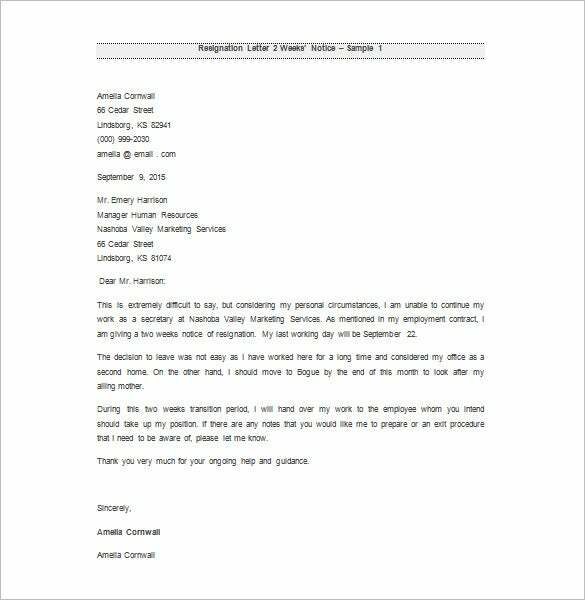 Well, a retirement resignation letter template sample starts with the information of your decision to retire followed by how much you have relished working in the company. You should also assure your interest to help the firm, if needed, post retirement. 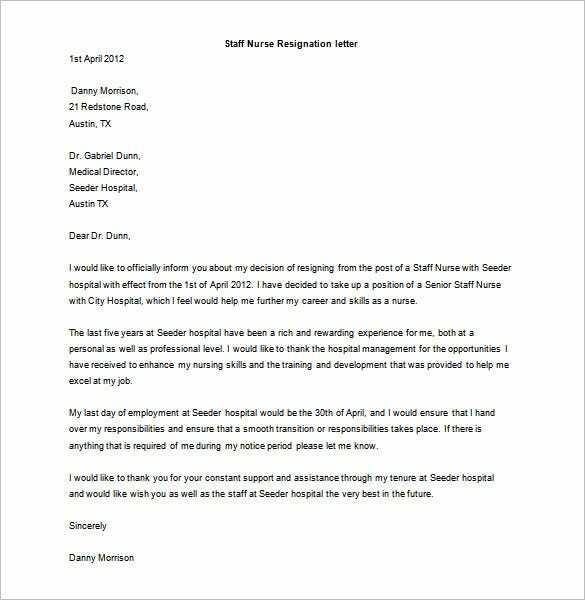 This resignation letter template would be very useful to a nurse. 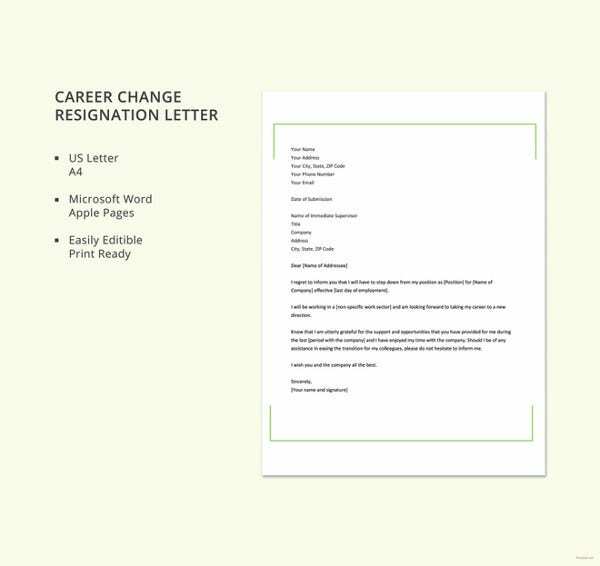 If you’re a nurse and you’re calling it quits, this resignation template will help you make the announcement in the best way possible. 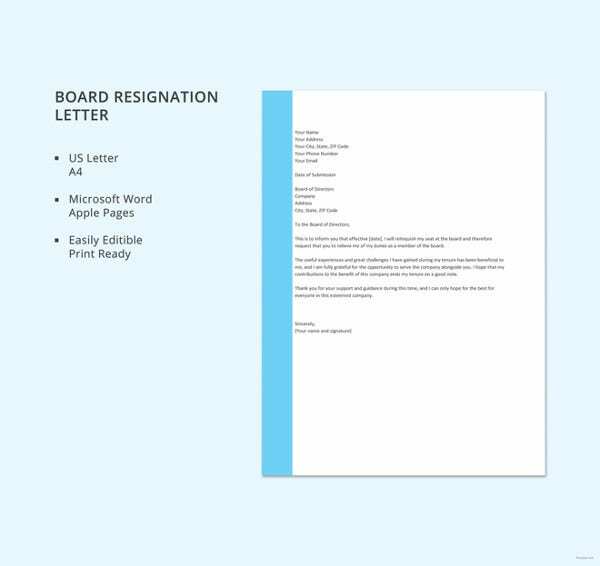 The introduction of the letter contains details about your decision to quit, followed by thanking your boss and staff in your current workplace. 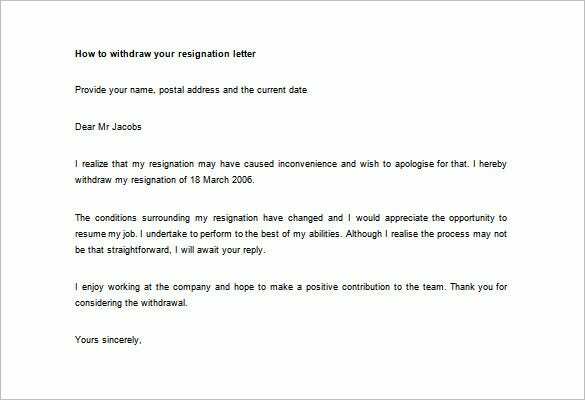 A Resignation Withdrawal Letter sample initiates with a serious apology from the employee’s part for the sudden change of mind. You should also state the important reason that forced you to ask for a withdrawal of your resignation. Finally you will convey that it has always been fantastic to work in this company and you are hopeful for such a relishing experience once again. 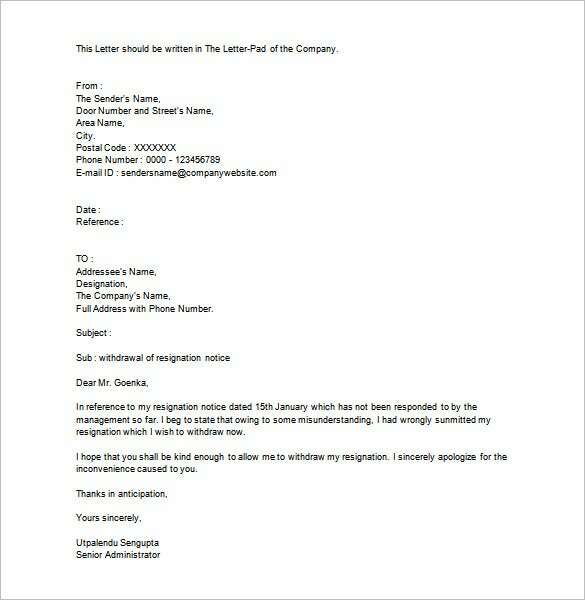 Submitting a resignation cancellation letter is the most difficult thing to do soon after you’ve given in your resignation letter. 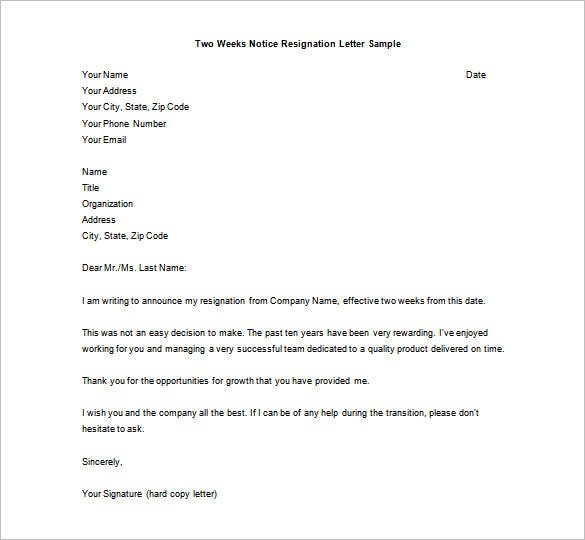 If you’ve found yourself in such a situation, this resignation cancellation letter template should help you do the deed rather smoothly. The tone of the letter is profusely apologetic – has to be if your current employer already commenced the replacement process. Mentioning the reason of cancellation is mandatory.